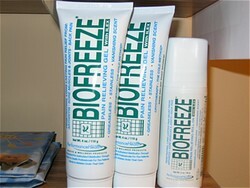 Biofreeze is one of our most popular products. Biofreeze is a very unique, effective pain reliever formulated to provide a variety of benefits for therapy, pain relief, exercise training and overall comfort. Once you've tried Biofreeze you'll never want to be without it. We carry several different sizes and types including: sample packs, gel bottles, roll on bottles and the convenient spray bottle.